Our company is one of the responsive and responsible Suppliers of a wide range of Aluminium Profile. Owing to their strong mechanical properties, the Aluminium Profile we offer is used in the construction industry and for various decoration purposes. 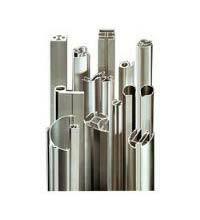 Our entire range is available in carried specifications and made of alloys of grades such as 6063, 6061, 6082 and 7075. Buyers can contact us anytime of the year for placing orders for Aluminium Profiles. We can provide customized Aluminium Profiles as well.